Today is a day of joy because we are celebrating God’s Love that is stronger than death. That Love is so strong that it took Mary to heaven, body and soul. 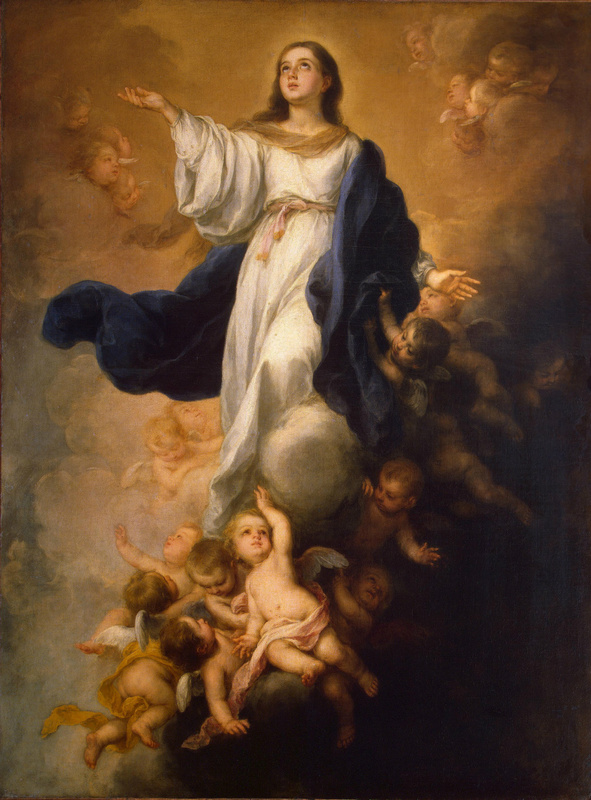 We call this mystery the Assumption of Mary into heaven. And guess what? God’s Love is so strong that it is going to take us all to heaven. There is enough room up there for all of us, body and soul – so it must be a big place! Let’s think about how Mary got up there. Was it like a really high jump, or was it like superman? NO!!! We heard the answer before. It was by the power of God’s Love. And we too rely on the power of God’s love to take us to heaven. Let’s look at Mays life and see how we get the power of God’s Love into us. Because Mary was special (Immaculate), she didn’t need baptism to have Gods Love in her heart. It’s different for us though. We get the power of God’s Love poured into our hearts when we are baptised. But it’s not that simple. God’s Love is designed to fill us to the full. The emptier we can make ourselves of ourselves, the more God fills us with the power of his Love. Mary is great because she made herself little. She proclaimed: My soul magnifies the Lord. My soul proclaims the greatness of God because God has looked upon my littleness and has filled me to the brim! God was huge, and Mary was only little! She knew that if God is great, we become great by making ourselves little and relying completely on God! The special thing about Mary is that she had the ability to rely on God for everything and in every moment of her life. And because she was the humblest person ever, everything in her heart came from God. It is ironic that the littler she tried to be, the more she magnified God and the greater she became. Mary simply put Gods 1st commandment first. We can’t love our neighbour without first having the Love of God in our heart. We have learnt a beautiful lesson today. When we make ourselves little, God becomes more, and the more powerful we become. The glorious Assumption of the Mary into heaven did not happen by her own power. She had no power of her own to undertake such mysterious flight into heaven. It is the power of God’s love working in her, because she had made God great in her life. Mary is with Jesus in heaven right now and we are going to join them. It’s beautiful that we have a mother in heaven. And we are all invited to heaven. Do you know the way? That way is to make God great in everything that we do by following Jesus with all our heart. The trick is to empty our heart of all that is not of God, and ask Jesus to fill it to the full! On this feast day, let us thank the God for his Love that is so strong that it is going to take us to heaven. In special way, we thank God for the gift of our heavenly mother, Mary. We ask Mary’s help to make God great in our life. Through her intercession may Jesus fills our hearts to the full with God’s Love, and may this Love take us all to heaven. Amen.